This video can be used in any lesson on permafrost and the carbon cycle. Preview the vocabulary for younger students. Locate the area on map or computer. "In our experiment, we are focusing on how permafrost qualities change over both space and time. First, we are comparing how the active layer differs across different landscapes, including lowlands, ridges, and tundra. Second, we are comparing the composition of the three permafrost layers to determine if there have been changes in organic matter over time. Finally, we are examining a potential connection between the active layer and water by testing what and how many nutrients are 'picked up' by water passing through the active layer." Comments from expert scientist: The video is very effective at portraying field work in a remote and challenging environment. The narrative effectively provides a human element to the science. The importance of the study, or reason why people are looking at thawing permafrost is never explicitly stated. Video is narrated by the university students who are conducting the research; some text provided. 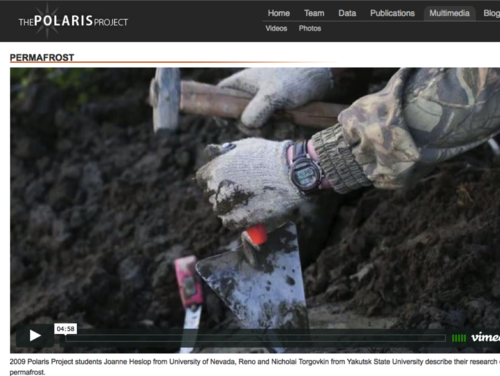 Unusual opportunity for students to see other students conducting research in the field in Siberia.